Using a jarred sauce is a simple and perfect way to make a glaze that sticks to meat or poultry. Not only is this dish easy but very tasty; no heat just a great sweet and savory flavor. The slab of ribs purchased had 8 meaty ribs and was perfect for an appetizer based on two ribs per person. Double the recipe and serve as a meal with one of our rice dishes in the grains section. If doubling the recipe, make sure to bake a bit longer to accommodate the additional amount of ribs. Make Simple Syrup or use purchased kind. Spray a small Dutch oven or other covered baking pot with non-stick cooking spray. Place ribs flesh side down into the pot. Sprinkle with kosher salt. 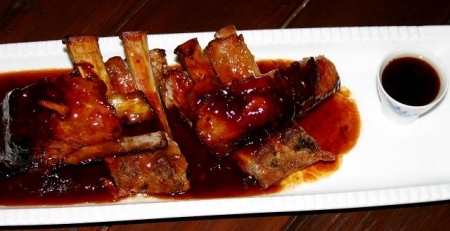 Evenly spread the remaining ingredients over the top of the ribs. Cover and bake in a preheated oven at 300 degrees for two hours or until meat easily falls off the bones. Try Vin du Lac of Chelan Viognier (Columbia Valley), Yalumba Viognier (South Australia), Graf v. Schönborn Riesling Kabinett Troken Hallburger Schlossberg, Blue Moon Belgian-Style Wheat Ale with orange wedges or Tsingtao (China).